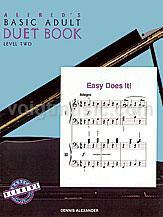 As with all Alfred's Basic Adult Piano Course materials, the Duet Books correlate exactly with Lesson Books 1 and 2. The duet parts are delightful accompaniments which serve to enhance the student's part. Adults will find the pieces fun to play, musically rewarding and very motivational.